There was no shortage of high school basketball around the state today. Here are some highlights from Saturday’s boys and girls basketball games. For the girls, class AAAAAAA top-dog Westlake took on class AAAAA first-ranked Buford. The Lions bested the Wolves 58-51 to give them their 19th win of the season and keep their undefeated streak alive. The Cherokee Warriors nabbed their 19th win of the season as well with a 68-60 victory over the Sequoyah Chiefs. Leading the offense was Senior Lacie McCoy who paced the team with 17 points. Class AAAAAA third-ranked Northview had a strong defensive outing against region opponent North Atlanta. The Titans held the Warriors to single digit points on their way to a 54-7 win to remain undefeated in region 7. The Rockmart Yellowjackets put up a huge 27-point fourth quarter performance after being down by one heading into the quarter to steal a 71-59 win over Chattooga, giving them their 8th region win of the season. Valdosta boasted a strong 62-43 win over Lee County to extend their region record to 4-0. 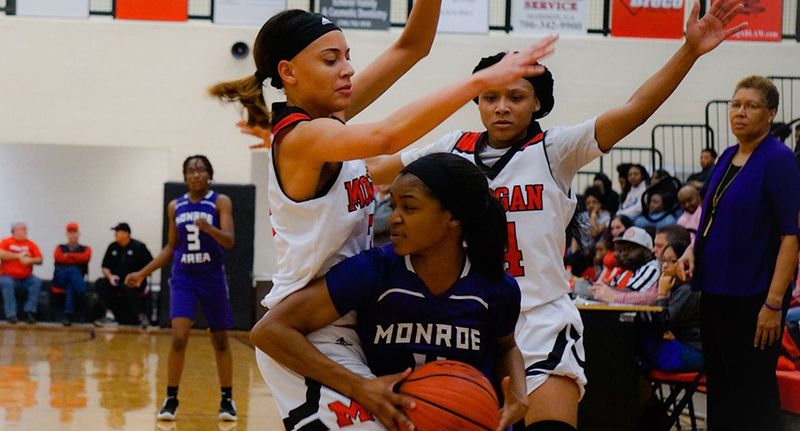 Morgan County continued to build on its strong weekend with a 68-57 win over Newton. Leading the Bulldogs offense was Senior Miranda Powell, who put up a tremendous 25 points on her birthday while Junior Tamia Benford scored 20. For the boys, class AAA Morgan County strung together a 24-point fourth quarter comeback to best the Newton Rams and extend their win streak to 15. Class AAAAAA top-ranked Coffee claimed a second win against Brunswick with a hefty 43-point second half. The Trojans now await their upcoming match against Houston County for a chance to remain undefeated in region 1. In class AAA, Carver-Columbus and Americus-Sumter face-off for the third time this season, splitting the series between the two first games. Tied 46-46 at the end of regulation, the Tigers outscored the Panthers 6-3 to take the series and remain undefeated in region 1. St. Francis stepped onto the court undefeated in class A-Private region 6B. The Knights were paired against a Mt. Bethel Christian team that gave them a hard-fought battle in December, but ultimately lost by two following a 28-point fourth quarter performance from St. Francis. This go-around, The Eagles were able to come out on top 76-71 to serve St. Francis its first region loss of the season.